For certain applications, self-propelled agricultural and construction machinery, such as wheeled and telescopic loaders, forestry machines, combine harvesters and also choppers, not only need to generate high tractive forces, but also have to be capable of covering long distances at the highest possible speed. Up to now, both of these functions have been realised by hydrostatic drives with manual gearboxes. This concept has proven to be less than optimum in practice, since the machine usually has to be at a standstill to switch between gears, making the procedure both inconvenient and time-consuming. 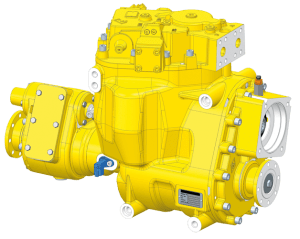 Continuous variability is what is called for here in practice – with a variable drive concept and substantially greater operating convenience for the driver. 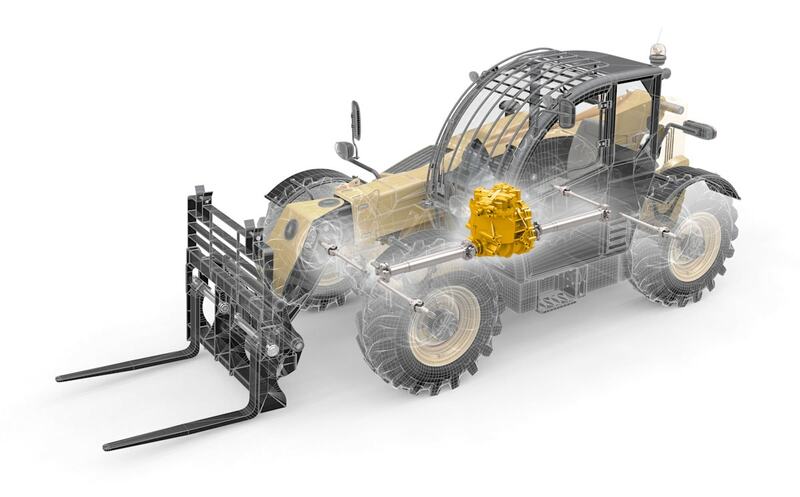 Walterscheid developing a continuously variable, hydrostatic travel drive for self-propelled agricultural and construction machinery. 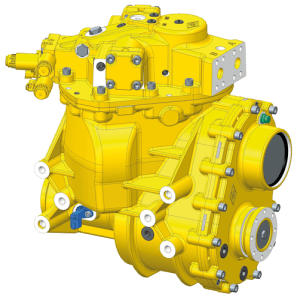 The ICVD® (Integrated Continuously Variable Drive) makes it possible to drive through the entire speed range without interrupting the tractive force. The ICVD® is thus a symbiosis of time-proven drive concepts, combining their advantages, but without having to accept the drawbacks of the old solutions. 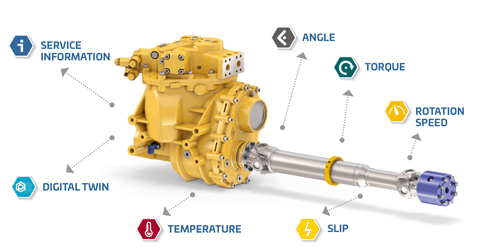 The ICVD® is the only continuously variable, hydrostatic travel drive to use 45° large-angle technology and comprises a gearbox, a hydraulic motor and a control unit. The new continuously variable travel drive ICVD S1N 370V provides convincing answers to growing requirements in terms of tractive force, speed and energy efficiency of agricultural and construction machinery. Tractive force is provided through the entire speed range up to 40 kph without a shifting process or interruption. This ensures high user comfort and also has significant effects with regards to energy efficiency. That is particularly true for full vehicle power management systems with one motor powering different components. 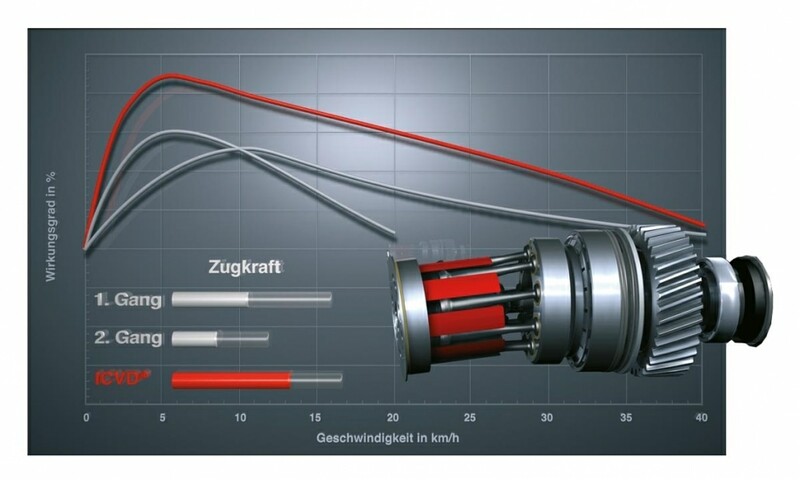 As no friction clutches or additional hydraulic motors are required, this technology also delivers convincing results in terms of reduced drag-torque and costs of the system in comparison to multi-motor concepts. A standard control component which already is in use in other drives was integrated into the new continuously variable travel drive. This offers various control options and ensures perfect compatibility with available controller and software interfaces. In addition, the use of this high-volume component allows for maximum ruggedness and reliability of the new continuously variable travel drive. 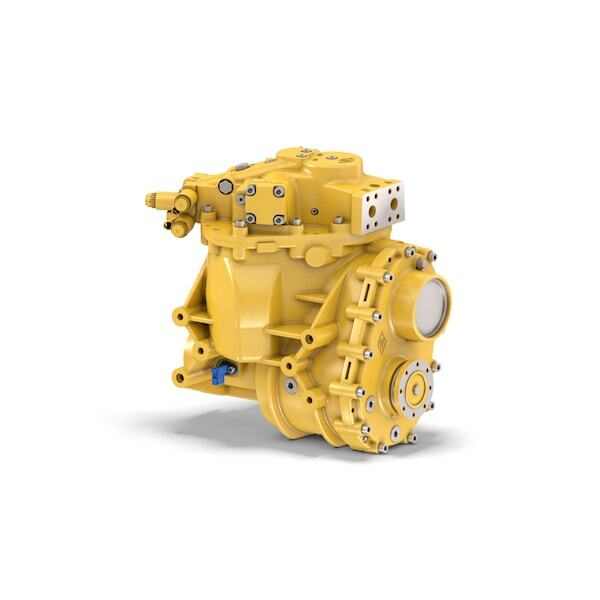 Despite the extremely compact dimensions of hydraulic motor and gearbox, and a weight of approximately 200 kg, the high-performance travel drive offers a convincing power capacity of 130 kW. The ICVD P370 is based on a bent axis motor kit with corresponding swivel mechanism and control unit and was developed for trouble-free application in a wide range of agricultural and construction machinery. 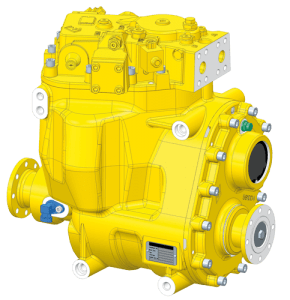 The ICVD P370 was designed in a joint development project by Walterscheid and Danfoss Power Solutions as a key partner, thus allowing for a systematic and holistic approach. Walterscheid Powertrain took particular responsibility for construction, manufacturing and test bench trials whilst Danfoss Power Solutions provided technical expertise as well as support for system and component integration especially during the development phase and vehicle testing. 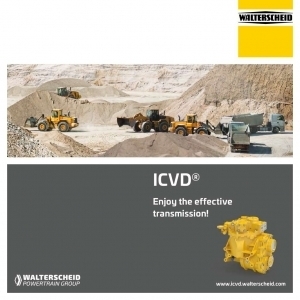 The design of the ICVD® meets two essential requirements: compact and modular. This makes it possible to realise highly flexible and inexpensive drive solutions in practice. 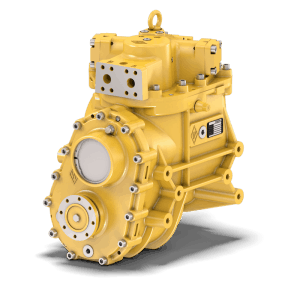 The ICVD® consists of a control unit, the gearbox (mechanical drive) and a hydraulic motor. This compact assembly is universally adaptable in the vehicle, directly on the axle or on the vehicle frame. The ICVD® is currently available in performance classes with different torques, allowing manufacturers to equip their entire machine portfolio. The specified performance parameters for tractive power, engine output and speed decide the version to be used, which is then individually configured by the ICVD engineers on the basis of vehicle-specific parameters. 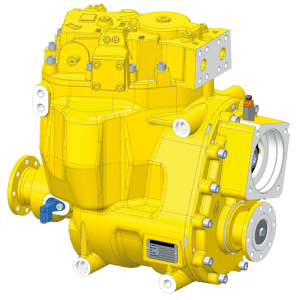 The entire range has a modular structure so that it is not only possible to realise individualised customer solutions but, in addition, common parts standardised according to the modular design principle are also available. These include core elements, such as the control unit, the swivel bracket and the drive, as well as blanks for internal parts. The ICVD® possesses a number of design features that add up to a totally new travel drive. 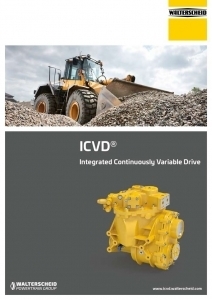 At the heart of the ICVD® concept is the use of a hydraulic motor featuring „large-angle technology“. This permits pivoting of the motor up to an angle of 45°, instead of the usual maximum of 32°. 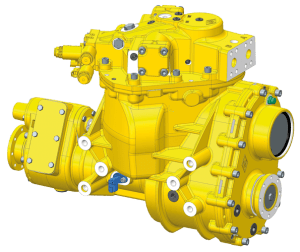 Both the hydrostatic conversion range and the efficiency are substantially improved, making this technology a real alternative to the previous concepts. For manufacturers of agricultural and construction machinery, as well as municipal vehicles, Walterscheid offers a modular range that also allows the realisation of individual customer solutions. 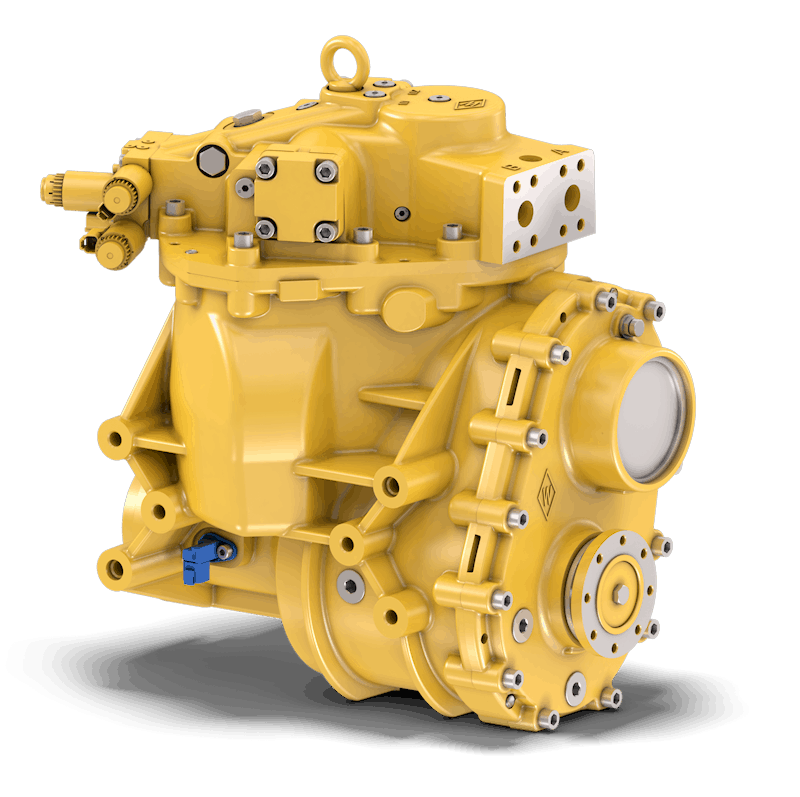 The current range comprises five versions with different power ratings, with which manufacturers can equip their entire machinery portfolio. Following exhaustive test phases, many equipment manufacturers are now using the ICVD® in practice. “Even in today’s urban traffic, a machine that goes no faster than 20 km/h is a hindrance to traffic. There are so-called high-speed machines that do up to 40, but to reach top speed they have to change straight into second gear from a standstill. That can be a problem on hilly terrain with a trailer, especially if you have to do a hill start. In contrast, the driver with Ecospeed transmission can ‘relax’. He can go from zero to 40 without even changing gear, and with full tractive power in every situation. Higher loading capacity and speedy travel CLAAS uses the ICVD® for the latest generation of Scorpion telescopic loaders. Expansion of the range of applications to include self-propelled agricultural machines, such as combine harvesters, choppers or beet lifters, and use in numerous construction machinery categories is currently being tested or realised.